Here in the National Forest the sawing can be accomplished with chain saws. The rigging and hoisting is all done with big hand winches without much trouble, and 4' pry bars to finish, all assisted by gravity. So how do you top THAT?! Their next project is high in the San Jacinto Wilderness, which means no power saws - they have cut this monster out by hand. I'll post those photos here after they finish. Pete Fish's Trail Gorillas continue working in the 2009 Station Fire burn area. Pete has been working the area, heavily-infested with toxic Poodledog Bush, every spring. 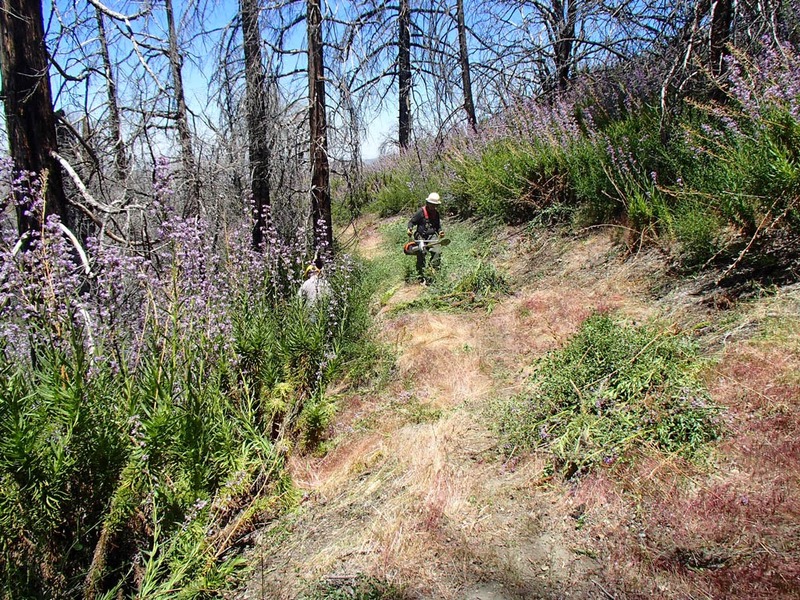 This spring after clearing the many blowdowns and starting work on the PDB, several windstorms occurred that blew down dozens more burnt trees, delaying clearing out the PDB as Pete and the TG's cleared the trees again. On Saturday our crew cleared the last tree (a big one), and finished brushing Mile 428. According to Pete, trail miles 412 thru 434 are now cleared. Making piles. We then pitch them offtrail with a hay fork. When Angeles NF allows us back in to work in the Powerhouse Fire burn area in Section E, we'll likely have to fight the PDB there for the next couple of years. Maybe it can be controlled a little better out there since it's lower elevation, warmer, and less remote for crews' access. Poodledog is a tall stalk with fuzzy-looking leaves and colorful purple flowers on top. 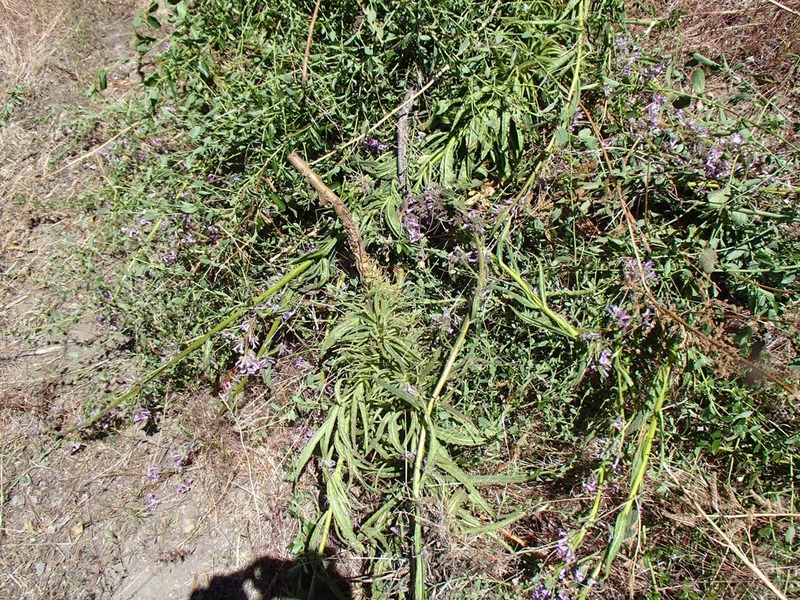 It has a funky scent, and causes contact dermatitis - a burning allergy-reaction rash. Some people are more sensitive than others, and though we've been cursing it for four years now, it is a native. It takes over after fires, serving to hold soil in place and shade the ground for better water retention and then tree seedlings can germinate. It actually works really well for that, and then starts to abate as those other plants take over. The hummingbirds appear to be big fans of the plant's flowers as well, which are pretty easy access for them.